If you have ever tried to witness to a committed Catholic, you may have discovered how frustrating it can be. However, there are resources available which can be very helpful in leading them to Biblical truth and faith in Christ alone for salvation. 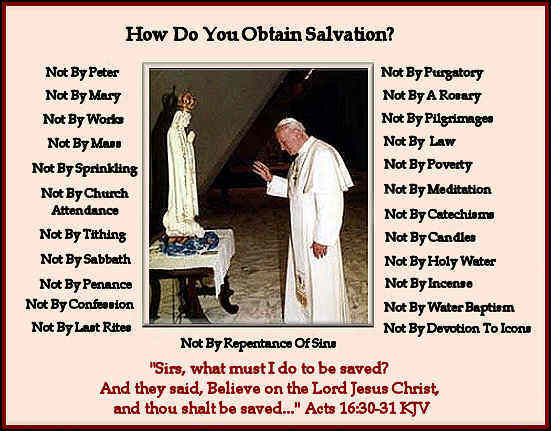 Papal primacy from Peter, the claim that the canon of scripture was given to us by the Popes, and other common errors taught by Rome are refuted on any number of Christian apologetic websites. Here are a few examples. Some are resources generally suited to lay people, with short simple explanations on a variety of issues. There are also more scholarly resources, some containing articles by ex-Catholics who are highly trained in Catholic history and theology, but reject it's errors. Since many doctrines and dogmas of Catholicism are in opposition to a sound exegesis of scripture (or have no scriptural support at all), Catholic apologists often resort to the pretense of Papal primacy and magisterial authority. Let no one deceive you - their claims to authority are based on known forgeries and a deceptively selective and inventive use of records left by Church "Fathers". Their arguments can seem very convincing - until you check for historical accuracy and context. See The Church Fathers' Interpretation of the Rock of Matthew 16:18. History does not validate the Pope's claims, it actually exposes them as deceivers. If you have been misled about Christian history, this article would make a good start on your quest for truth. Were the Early Christians Roman Catholics? 2 Peter 3:14-18 "...make every effort to be found living peaceful lives that are pure and blameless in his sight... Be on guard so that you will not be carried away by the errors of these wicked people and lose your own secure footing. Rather, you must grow in the grace and knowledge of our Lord and Savior Jesus Christ." Here is link to a comprehensive article, exposing the Vatican's past and present crimes and corruption.